Virgin Australia plans to raise $852 million in fresh capital through a share offer to existing shareholders and shed aircraft as part of efforts to improve its balance sheet. The company announced the two initiatives on Wednesday, after concluding its capital structure review. Under the share offer, existing shareholders can purchase one new share for every share they currently hold at a price of 21 Australian cents per share. This is a 28.8 per cent discount to the company’s closing share price of 29.5 cents on Tuesday. Further, Virgin said Singapore Airlines (SIA), HNA Innovation (a subsidiary of HNA Aviation Group), Sir Richard Branson’s UK-based Virgin Group, Nanshan Group and Air New Zealand have committed to take up their full pro-rata entitlements. However, Virgin’s other major airline shareholder Etihad Airways has not committed to take up its full pro-rata entitlement. Abu Dhabi-based Etihad said it was still looking at the capital raising and reaffirmed its commitment to the Australian carrier. “Etihad Airways is a long-term strategic investor and partner to Virgin Australia. We are fully committed to this partnership and to remaining as a shareholder,” an Etihad spokesperson said in an emailed statement on Wednesday. “Our comprehensive 10-year commercial agreement is further evidence of our confidence in and support for Virgin Australia, and our commitment to the airline and Australia. And should the offer not be fully subscribed, SIA, HNA and Virgin Group have also made binding commitments to contribute to the sub-underwriting of entitlements not taken up by other shareholders. SIA said in a statement to the Singapore stock exchange it was “confident of the long-term prospects of Virgin Australia and was committed to supporting its long-term growth”. “The SIA commitment will enable the company to remain as a substantial shareholder of Virgin Australia, and is in line with the company’s intention to ensure that its stake in Virgin Australia is not significantly diluted as a result of the HNA placement and the Virgin Australia entitlement offer,” SIA said. The $852 million capital raising, when added to the $159 million share placement with HNA Group, brings the total amount Virgin is raising to $1.011 billion. “As a result of the upcoming equity raising, the Group will have a capital structure that is appropriate for its position as a mature, diversified airline group and will be in a stronger position to deliver sustainable growth,” Virgin Australia chairman Elizabeth Bryan said in Wednesday’s statement. Meanwhile, Virgin said it would withdraw an unspecified number of ATR 72 turboprop aircraft, as well as remove all Embraer E190s from its fleet, over the next three years. This would assist the airline group in “simplifying its business and becoming more scalable and productive”, Virgin said. The company was targeting improving operating efficiencies in crew and ground operations, as well as in maintenance, engineering, procurement and its supply chain. 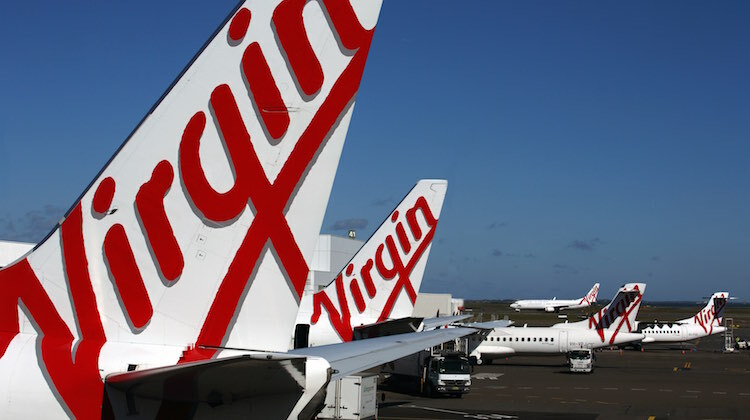 “Through the successful implementation of the program, the Group is targeting net free cash flow savings increasing to A$300 million per annum (annualised run rate) by the end of the 2019 financial year,” Virgin said. Canada to bridge fighter gap with interim Super Hornet acquisition? I feel this may be their last chance. If this doesn’t work their staff will be out of a job. Will be very sad to see the E jets disappear from the fleet. When travelling, I always choose to go by E Jet where possible. Much more intimate environment than the other narrowbodies. Our upcoming booking, mid July, has been transferred to 737. Is Virgin actually good at anything other than raising money and spending it? From a passenger perspective, the E190 is just brilliant. It’ll be a real shame to see them go. So what then fills the 100 seat ‘market’? Unfortunately this could be shuffling the Deck Chairs on the Titanic! The Ansett like, mixed fleet of too many types has been around quite a while now, and yet its taken this long for someone at Virgin to realise its not a good idea, and try to fix it! Hard to see why the major airlines in Australia can’t service the large regional jet market and corresponding domestic routes. There are several city pairs in Australia that would seem to have a workable yield in the sub-100 seat market but the major airlines can’t seem to make them work. Perhaps it is a hangover of the State-based route subsidies that have served only to focus a hub mentality around capital cities in Australia. Instead it is carriers like Air North with their E170s that now seem to be exploring these market opportunities, as Virgin, like Qantas, pairs back operations to service only trunk routes or subsidised intra-state routes. I like E190’s with their 2-2 seating. I hate 3-3 seating. They are great for medium haul regional domestic services. Not sure why they want to get rid of some of the ATR72’s, as this means the down sizing Virgin Australia regional services by 16 to 20 aircraft over a 3 year period unless Virgin Australia is going to prune some regional routes. I some what curious to why Air NZ has signed up to the ‘full pro-rata entitlements’ after approving 19.98% sale of their shares to Nanshan Group a week ago. If they are committed to this latest pro-rata proposal, it seems that Air NZ is going to keep their theoretical 3% of Virgin Australia shares. thanks for buying SkyWest and then dismantling it. My booking later this year to Brisbane has me outbound on an E190 AND HOME ON A 737.I have only just found out the ADELAIDE TO BRISBANE 6:20AM flight is now a 737.Agency has not told me anything as such.I suppose a lot can change between now and December 22nd.I booked that flight to get to the cruise specially for the Embraer.If this was the case I would have paid extra for Qantas as once the E190’S go with no immediate replacement there’s nothing to tell the two carriers apart on the non wide bodied sectors out of the smaller cities. I’d say that’s quite a possibility……given this seems to be their ‘business practice’! Doubt it very much. It’s a state of affairs which cannot continue long-term, or they’ll be in really deep ‘doo-doo’, & unable to extricate themselves! Pity to see the Embraer’s go as they are so much better than the tired old Fokker’s that Qantas continue to inflict on passengers. Why retire the Embraer E-190? It’s still flyable for another 5-10 years.